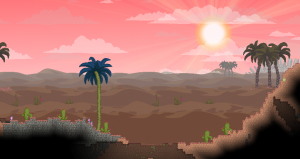 Sun rising over a desert biome. Desert is a primary biome type characterized by sand, clear weather, cacti, and palm trees. Desert planets are a 'moderate' threat level, geared toward tier 2 in progression. Desert biomes can be created and expanded using a Sandy Terraformer, and a planet will convert to a Desert planet once half of the planet's surface has been terraformed into Desert biome. Desert planets can be found orbiting gentle (white), temperate (orange) and radioactive (yellow) star types. They also have a rare chance of being found around frozen (blue) stars as satellites of gas giants. There are no environmental hazards in desert biomes which require use of an environmental protection pack. Possible mini biomes inside deserts are oasis, tar, colourful, and bones. In addition to wood gathered from trees, deserts have cacti which can be harvested and replanted which produce cactus. Batong, Bobot, Crustoise, Fennix, Ignome, Iguarmor, and Peblit all have a chance of being found in desert biomes. Deserts are one of the best places to gather sand, which is used as an ingredient in a number of crafting recipes. There is limited flora here, but the location does support life. There is also an abundance of sand. Simply put, it is a desert. A desert area populated by cacti, as well as various animal life. A relatively safe landing site, so long as you avoid the sandstorms. Sand. Readings indicate sand. Also some cacti... but predominantly sand. Given the available information I speculate that the landing site is situated in a desert. The surface layer of deserts is primarily made up of sand, along with loose silt, sandstone and cobblestone. There's gatherable wood from palm trees and cactus from cacti. The planet's primary color in the navigation console and while orbiting above is the primary color of the sand found there. Most common early game ores are found in desert biomes, with of copper, silver ore, gold, iron and tungsten available near the surface. Desert biomes use the Day Tracks during the day and the Night Tracks during the night. A tar mini biome inside a desert. 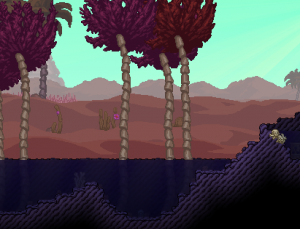 There are sub biomes which can be found on desert planets in addition to their unique mini biomes. Barren or savannah have a chance to appear as smaller biomes on desert planets. These biomes will include things like their associated blocks, trees, and crops when they appear. Mini biomes for each of these secondary biome types can appear inside them as well. Deserts can also be found on a number of different planet types as sub biomes. They have a chance of being found as sub biomes on savannah, midnight, and volcanic planets. Oasis, tar, colourful, and bones are mini biomes found inside desert biomes. These mini biomes can be found on desert planets or inside desert sub biomes on other planet types. These mini biomes each have their own creatures and items outside what's available in desert biomes. Oasis - Water in the desert! There are reeds and pools of healing water found here. Tar - Sticky thick tar will slow players down here. Colourful - The palm trees here are very colorful, and drop rainbow wood. Bones - Dry bones cover the ground in this biome, which often has small settlements of hostile enemies. Desert planets stick to the defaults for most layers. However, Desert planets have a unique subsurface layer that always appears. Weather in desert biomes is mostly clear, with occasional sandstorms. These storms, in addition to slowing down living things caught inside them, will often lay a layer of loose silt over the surface. Beakseed can be found growing wild in deserts. These can be harvested by interacting with them or by digging them up. They'll drop produce and have a chance to drop a seed which can be replanted. In addition to palm trees which drop wood desert biomes also have cacti which can be replanted. These drop saplings instead of seeds and function just like trees except they drop cactus. In addition to procedurally generated creatures, there are a variety of unique monsters, bugs and critters found in desert biomes. Some of these are also found in other biomes, while others are unique only to desert biomes. While these unique creatures have a chance to appear on desert planets, they will not all appear on each one. In addition to unique creatures, each biome has multiple types of both procedural ground and flying creatures. There are a variety of items which are specific to Pod Chests and Old Chests found in desert biomes. Some of these may have a chance of being found in other places throughout the universe, but they've all been specifically allocated to chests within desert biomes. Chests in deserts also commonly contain Cactus Juice and Mining Lanterns. Deserts can have a large variety of settlement types found on them. These include small microdungeons and NPC camps, larger racial villages and hostile dungeons. Smaller desert planets usually contain only one dungeon or village, while larger desert planets can contain as many as three. Bone Pile Breakable 80 A pile of bones, prime for smashing. Bone Pile (ribs) Breakable 80 Part of a ribcage. It won't be intact for long. Bone Pile (tall) Breakable 80 A pile of bones, prime for smashing. Flickering Lightbulb Light Source 60 A bare lightbulb hanging from a metal rod in the ceiling. Open Cardboard Box Storage 45 An opened cardboard box. Primitive Furnace Crafting Station 50 Used to turn ores and other materials into crafting ingredients. Sandstone Bricks Block 0 Bricks made from smoothed sandstone. Sandstone Chest Storage 40 A chest of roughly hewn sandstone. Sandstone Torch Light Source 35 This torch flickers softly. Smooth Tomb Brick Block 0 Old bricks, polished to perfection. Stepladder Decorative 60 A stepladder. Stone Platform Platform 0 A platform carved from stone. Tomb Brick Block 0 Dusty and ancient bricks. Wall Bookshelf Storage 75 A sturdy suspended bookshelf. Wooden Ceiling Lamp Light Source 25 A homely ceiling lamp. Wrecked Boiler Decorative 80 An old boiler. A dripping echoes from inside.